The Boeing C-137 Stratoliner is a VIP transport aircraft derived from the Boeing 707 jet airliner used by the United States Air Force. Other nations also bought both new and used 707s for military service, primarily as VIP or tanker transports. In addition, the 707 served as the basis for several specialized versions, such as the E-3 Sentry AWACS aircraft. The designation C-18 covers several later variants based on the 707-320B/C series. The C-137 should not be confused with the superficially-similar Boeing C-135 Stratolifter; although they share a common ancestor the two aircraft have different fuselages. USAF procurement of the Boeing 707 was very limited, amounting to three Model 707-153s designated VC-137A. When delivered in 1959 these had four 13,500 lb (6123 kg) dry thrust Pratt & Whitney J57 (JT3C6) turbojets; when subsequently re-engined with 18,000 lbf (80.1 kN) dry thrust TF33-P-5 (JT3D) turbofans they were redesignated VC-137B. 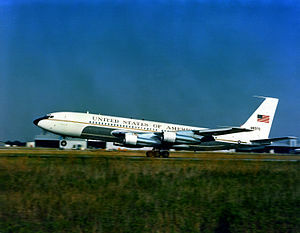 Only one other variant served with the USAF: this was the VC-137C Air Force One presidential transport, the two examples of which were Model 707-320B Intercontinentals with specialized interior furnishings and advanced communications equipment. Two further non-presidential C-137C aircraft were later added. To supplement its VC-137s, the USAF converted several C-135 airframes to VC-135 VIP standard, and these were used for staff transport mainly within the United States. An EC-18B Advanced Range Instrumentation Aircraft (ARIA) takes off on its first flight at Wright-Patterson AFB, Ohio, following its conversion from a Boeing 707-320. The C-18 is the US military designation for the conversions of the 707-320B series. Eight second-hand (former American Airlines) 707-323Cs bought as crew trainers for the EC-18Bs, four later converted to EC-18B, two converted to EC-18D, one to C-18B; one was not taken into service and was used for spares. One C-18A modified with instrumentation and equipment to support the Military Strategic and Tactical Relay System (MILSTAR). Four C-18As modified alongside examples of the C-135 for Advanced Range Instrumentation Aircraft (ARIA) missions in support of the Apollo space program. The designation E-7 was originally applied to modified Boeing 707s before being replaced by the EC-18 designation. Original designation for two prototype J-STAR aircraft, later redesignated E-8A. Two C-18As modified as a Cruise Missile Mission Control Aircraft (CMMCA). Two second-hand (former Trans World Airlines) 707-331 aircraft modified for E-3 pilot and crew training. Two second-hand (former TAP Portugal) 707-382 aircraft modified for E-6 pilot training. Three 707-153s (58-6970, 58-6971, 58-6972) with a 22-passenger VIP interior and provision for use as an airborne command post, re-designated VC-137B. The three VC-137As re-engined with four Pratt & Whitney JT3D-3 engines, operated by the 89th Military Airlift Wing, redesignated C-137B. The three VC-137Bs redesignated when downgraded from VIP role. Two 707-353Bs (62-6000 and 72-7000) were purchased by the USAF (one in 1961 and one in 1972) for service as presidential transports with call signs SAM 26000 and SAM 27000; later redesignated C-137C. The two VC-137Cs were redesignated when downgraded from presidential use. SAM 26000 and SAM 27000 were retired in 1998 and 2001 respectively. Both are now in aviation museums. Two further C-137Cs were acquired by the USAF, one 707-396C (a seized aircraft formerly used for arms smuggling acquired in 1985) and one 707-382B bought second hand in 1987. Two aircraft built as Early Warning and Control System prototypes. Later re-engined and re-designated E-3A. A further second-hand 707-355C aircraft was acquired and configured as an airborne special operations command post. Airborne warning and control system (AWACS) aircraft that provides all-weather surveillance, command, control and communications, to the United States, NATO and other air defense forces. Based on the 707-320B, production ended in 1992 after 68 had been built. The E-8C Joint Surveillance Target Attack Radar System (Joint STARS) is a USAF airborne battle management and command and control (C2) platform that conducts ground surveillance to develop an understanding of the enemy situation and to support attack operations and targeting that contributes to the delay, disruption and destruction of enemy forces. NATO Trainer-Cargo Aircraft (TCA) operated to support E-3A AWACS training and air transport/cargo for NATO (NAEW&CF) based on Boeing 707-320B. Canadian Forces designation for the 707-347C. Five were purchased new in 1970. IRIAF operates 707 Tankers and Transports. The 707 Tanker/Transport. Italy purchased and converted four 707s, two to tankers and two to a straight freighter. No 707 tankers remains operational as of 3 April 2008. Also, Omega Aerial Refueling Services operates K707 tankers for lease. The Royal Saudi Air Force purchased eight E-3 airframes configured as aerial refueling tankers. Airborne Early Warning, Command and Control (AEWC&C) aircraft developed in conjunction with Israel Aircraft Industries (IAI) using a former Lan Chile aircraft. 58-6970 Model 707-120 USAF VC-137B "SAM 970", Museum of Flight, Seattle, WA. 58-6971 Model 707-153 USAF VC-137B is on display at the Pima Air and Space Museum adjacent to Davis-Monthan AFB in Tucson, AZ. This aircraft became known as "Freedom One" after serving in the return of the American hostages from Tehran, Iran in 1981. 62-6000 Model 707-320B (VC-137C SAM 26000), a former Air Force One aircraft, is on display at the National Museum of the United States Air Force at Wright-Patterson AFB near Dayton, Ohio. 72-7000 Model 707-353B (VC-137C SAM 27000), a former Air Force One aircraft, is on display at the Ronald Reagan Presidential Library in Simi Valley, California. ^ a b Gunston, Bill. The Encyclopedia of Modern Warplanes, p. 64. Aerospace Publishing Ltd, 1995. ISBN 1-56619-908-5. ^ "DOD 4120.15-L - Addendum". US DOD via Andreas Parsch, Designation-Systems.net. Wikimedia Commons has media related to C-137 Stratoliner.